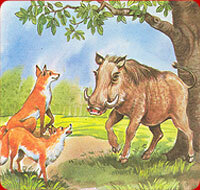 Two foxes watched a wild boar sharpening his tusks on a tree-trunk. "Why do you do that?" asked one of them, "the huntsmen are not out today." "Let that be so," answered the boar, "but whenever my life is in danger, I shall need my tusks and there will be no time to sharpen them." MORAL: Lost time cannot be recalled.